This house sit came up very unexpectedly due to a sudden death in the family. 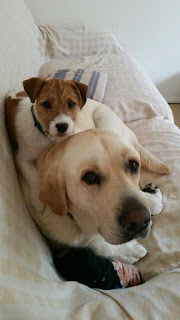 We are now on the farm where we will be looking after three delightful dogs; two Labrador/ Golden retrievers Oakley and Nellie as well as the 13 week old Jack Russell puppy Cino; 6 horses and 14 cows, 2 steers and three calves, with 8 more cows in calf but most not due for some months. But a couple may give birth while the owners are away and they asked us for photos of calf with mother if possible. They promised that there will be no work involved with the cows. But if a cow looks to be in difficulties calving we have been given the name of a woman to call who is a cow expert. The dogs are eagerly waiting for a morsel of cheese from Millie, the teenage daughter of the house. Cino (as in capuccino) sitting on top of Oakley. The two boys play rough games together with Oakley the big Lab sometimes being a bit rough but Cino loves it. Growing up with two adult dogs has made Cino a very well behaved, composed little puppy. Cino having a little nap on Marnee's lap. The actual house sit does not start for a couple of days but we are already here, getting acquainted with all the tasks and spending a few days with the owners Marnee and Nick and their adopted daughter Millie. The horses are in the background. Four need to be fed by us and two just graze on the grass available. The house which is east facing, getting the morning sun, with a nice shady verendah. Here is Andrew helping Nick with a fencing repair. Action man is in his element. Andrew wearing his new wellies. Not his actually, Marnee went out and bought a new pair for Nick as his wellies had worn out and, when we leave, Nick will retain them. It can get pretty muddy out there where the horses and cows graze. Andrew being shown the ropes with Henry the thoroughbred. Henry is an ex-dressage horse and he is the biggest of them all. 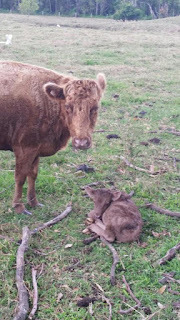 The new calf - born the night before last. After all the promises about the calving cows being no problem, the cow that gave birth had half its placenta hanging out the next day. 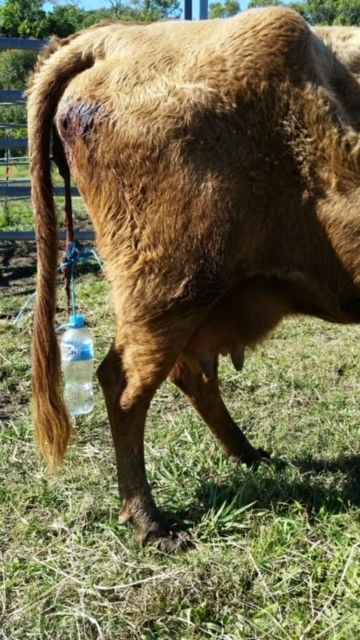 On the advice of the vet, Marnee tied a rope around the placenta and tied a bottle filled with water to weigh the troublesome after-birth down to pull it out. It was out by this morning but it was really smelly and Marnee thinks the cow may have an infection so the vet is coming this afternoon. He will probably stick an antibiotic pessary up the cows behind. Well, the vet came and it turned out the cow needed an injection rather than a pessary. A shot of a four day antibiotic. Ah, an unexpected state of bucolic bliss! Wow. I certainly didn't expect to see a bottle of water tied to a cow's placenta on your blog. What an adventure!